In December 2016 and March 2017, a salvage excavation was conducted at Giv‘at Yasaf (Tell er-Ras; Permit No. A-7849, A-7973; map ref. 208860–9115/762785–3075), in order to assess the damage of ancient remains caused in 2008 by mechanical tools. The excavation, undertaken on behalf of the Israel Antiquities Authority and financed by the IDF, was conducted by E.C.M. van den Brink (photography) and Y. Lerer, with the assistance of Y. Alexandre, J. Gosker, Y. Gur, A. Efron and R. Abu Raya (area supervisors), Y. Yaʽaqobi (administration), D. Eisenberg-Degen (field photography), M. Peleg (3D photometry), high-school youth volunteers guided by G. Cinamon and workmen from Kafr Manda and Nazareth. The tell sprawls over a kurkar hill. Several excavations were carried out in the sixties and nineties of the twentieth century over the entire area of the hill (Rochman-Halperin 1999; Fig. 1). They revealed in situ remains dating mainly, though not exclusively, from the Persian, Hellenistic, Late Roman, Byzantine and Mamluk periods. Three areas (E1–E3; Figs. 1, 2) were opened on the eastern slope of the hill. 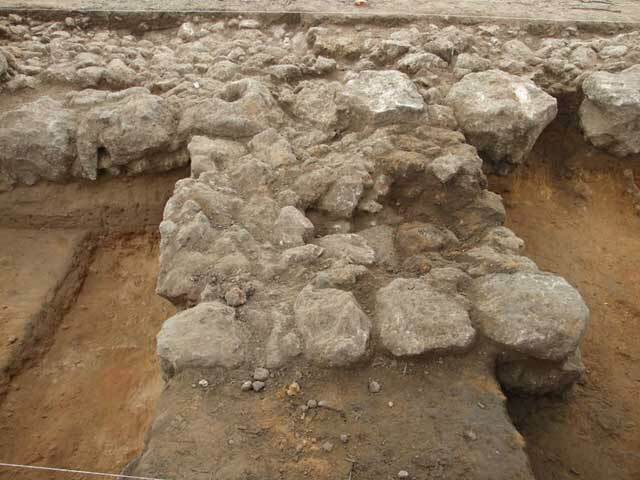 Area E1 revealed in situ remains from the late EB I, a rectilinear segment of a buttressed wall from the EB IIA and a disturbed human burial from the MB II. Areas E2 and E3 revealed to date only remains of British military barracks. All excavated soils were dry sieved, revealing abundant potsherds, several chipped and groundstone items, animal bones, an appreciable amount of Mediterranean Sea shells (foremost patella) and several samples of carbonized wood. The topsoil contained sporadic sherds from the Persian, Hellenistic, Late Roman and Mamluk periods that probably drifted from the hilltop. 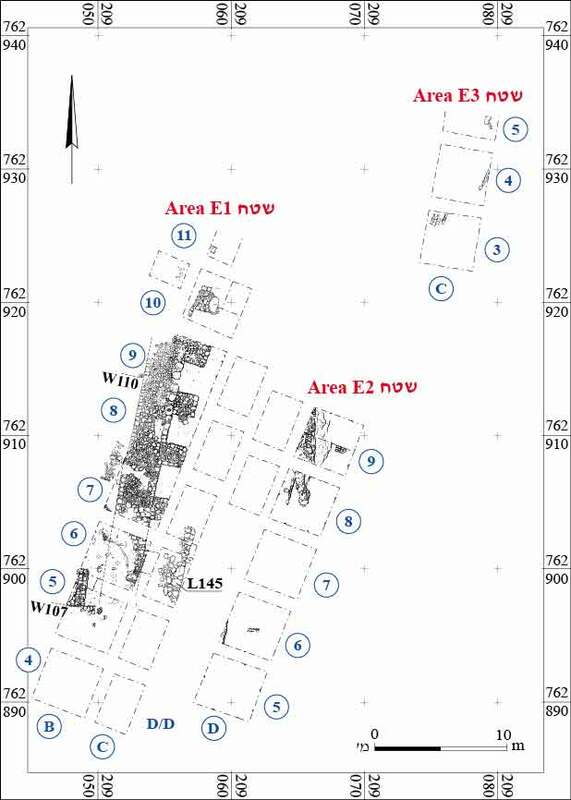 The excavation in Area E1 reached virgin soil (hamra) or the kurkar bedrock in only four squares in the northern part of the area (Sqs B10, B11, C8, C9). Late Early Bronze I. In situ remains of a small limestone surface (floor foundation?) and a circular stone-built installation were revealed in the southern part of the area (Sqs C4, C5); the numerous potsherds, of which not even one is of metallic ware, date the remains to the late EB I. Early Bronze IIA. A segment of a wide and fortified stone foundation, oriented north–south (W110; exposure length 16.5 m, width 2.7 m [5 cubits]; Figs. 3, 4), was revealed over a large area. The east and west faces of this foundation wall consist of large limestone boulders and rocks, with a core of cobble-sized stones and several larger stones in between them; it is possible that the core was constructed of separate cells or sub-units. The northern end of W110 was founded directly on sterile hamra soil, while its middle and southern sections were founded on soil deposits containing mainly late EB I potsherds and clearly lacking metallic wares. Six square stone buttresses (1.6 × 1.6 m [3 × 3 cubits]) were built against the eastern face of the W110 (Figs. 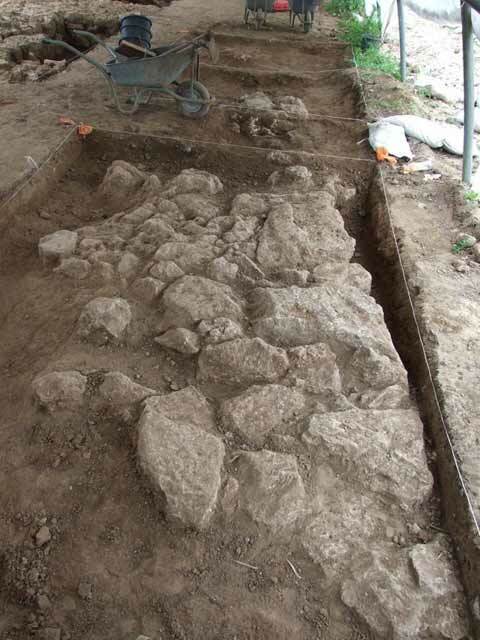 5, 6); only a small section of the southern buttress was exposed, since most of it was located outside the excavation area. These buttresses are 2.2–2.5 m (4 cubits) apart. 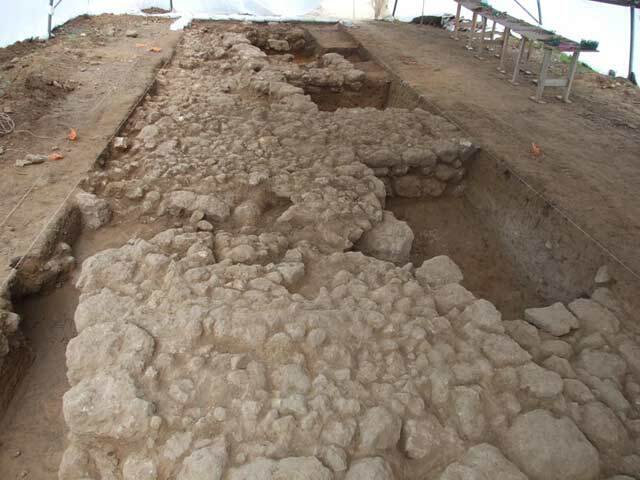 Without further excavation, it remains unclear whether W110 is part of a buttressed enclosure wall or part of a fortified structure, such as the EB III palace building at Tel Yarmut (e.g., de Miroschedji 1990). Sporadic mudbrick remains found in the area indicate that the upper structure of W110 was built of mudbricks. A few clearly intrusive potsherds from the MB II, Persian, Hellenistic, Roman and Mamluk periods were also found. The deeper layers, below the foundation courses of W110, were probed only in two places, yielding mainly late EB I potsherds without metallic wares. No floor levels were preserved in association with W110. Soil fills found beside the wall contained large amounts of metallic ware, pointing to an EB IIA date for its construction. 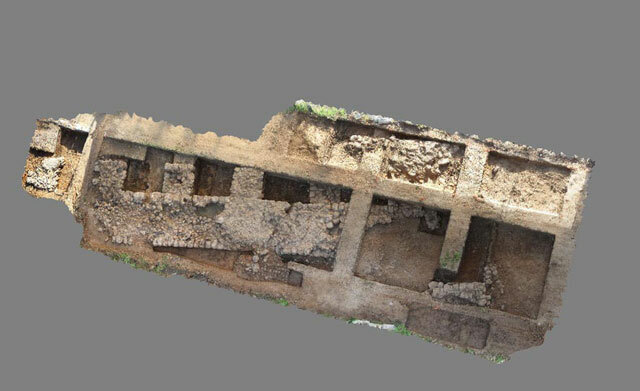 Although only further excavations at the site will be able to verify this, it seems that the southern part of W110 directly overlays the late EB I remains and cuts into them. Near W110, to its west (Sq B5), a short wall (W107; length 2.7 m; Fig. 7) was completely exposed; its length is similar to the width of W110. Near W110, to its east (Sq C6), was a stone platform (L145; Fig. 8) with a clear eastern vertical face. Middle Bronze II. 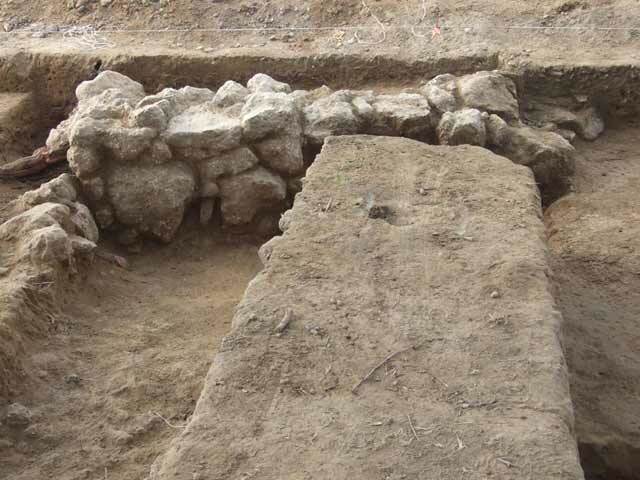 A human burial (L125), cut into the soil deposits covering W110, was uncovered in the southeastern corner of Sq C5; it was only partially excavated. This burial includes skull fragments along with sherds of a small red-slipped juglet, a disk-based carinated bowl and a bronze pin. The topsoil (thickness c. 0.5 m) in Areas E2 and E3 consisted mainly of an agglomeration of subrecent, poorly preserved cement, stone-wall segments and small installations, possibly the remains of several military barracks from the time of the British Mandate, as well as other modern finds, such as iron fence poles, electricity wires and barbed wire. In the northern part of Area E2 (Sq D9), a possibly earlier agglomeration of limestones and kurkar stones was exposed; its origin and nature will be further examined in a future season of excavation. The virgin soil was not reached in Areas E2 and E3. Miroschedji P. de 1990. 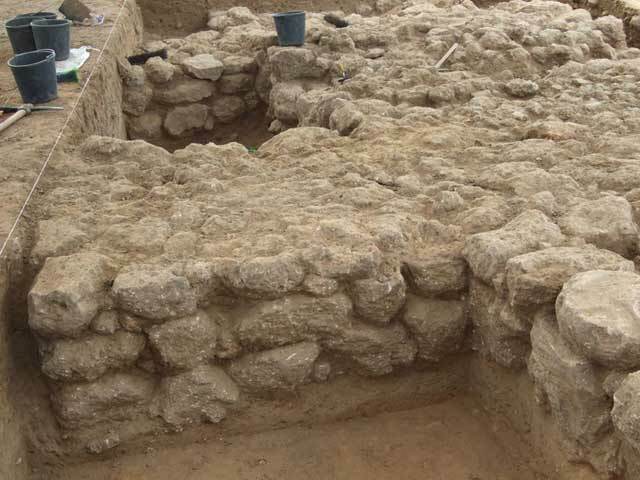 The Early Bronze Age Fortifications at Tel Yarmuth – An Interim Statement. Eretz-Israel 21:48*–61*. Rochman-Halperin A. 1999. Excavations at Giv’at Yasaf (Tell er-Ras)—1984–1985. ‘Atiqot 37:83–123 (Hebrew; English summary Pp. 172*–173*). 1. 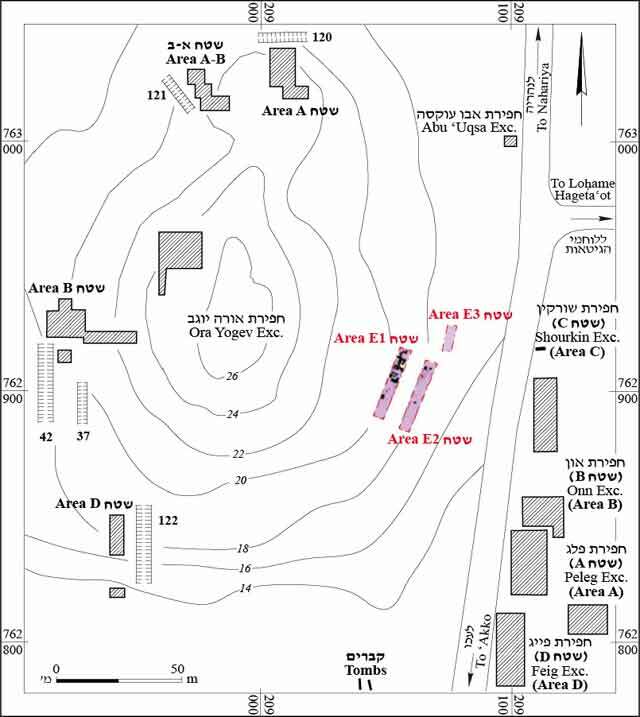 Excavation areas in Giv‘at Yasaf (After Rochman-Halperin 1999:84, Fig. 1). 3. Area E1, 3-D view to the east. 4. Wall 110, looking north. 5. Square stone buttress abutting W110, looking west. 6. Two square stone buttresses abutting W110, looking south. 7. Wall 107, looking west. 8. Wall 145, looking north.